Today’s OFF THE HOUR 5 to 6PM for updates on the Quebec Student Strike. The Quebec Student Strike is still happening? You bet it is. Tune in for the latest news from the student movement in Quebec! CKUT’s News team will be talking to members of the CLASSE about CEGEP strike votes, next steps, and more. 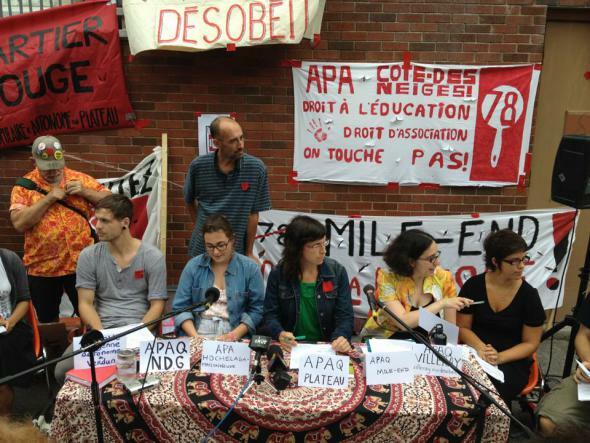 There will also be an in-depth look at Friday’s event Mile End: Dans la rue pour la grève social/In the street for social strike and how community involvement and direct democracy are shaping the Student Strike.